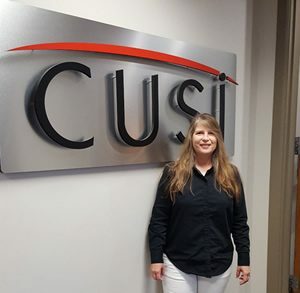 Get to know CUSI’s own Lisa Merrell, ETL Specialist, in our latest Staff Profile! Summarize your responsibilities at CUSI. Primarily I am responsible for converting customer data to work in our billing software. I look at data for the Sales Team before a new sale is made. I help the Implementation Managers with any problems they have with live/converted data to come with up with a solution. I recently moved a group of customers from my previous company, that sadly shut down, over to CUSI’s software. I appreciate all of the work that went into this transition. What is your educational background? I have a Bachelor’s Degree in Computer Science from Arkansas State University in Jonesboro, AR. What is your favorite part about your job at CUSI? I was very nervous to begin a career at CUSI after working from a home office for over 20 years. CUSI has showed me that working in an office environment is very enjoyable. I like how the employees work together in a team capacity to achieve a common goal. I also enjoy the activities CUSI participates in as a family. How do you create value for our customers at CUSI? I realize how stressful switching to a new software program can be. I work with the customers and implementation managers to make the transition as painless as possible. I was taught to say “I can do that” and then figure out a way to make it work so the customer is satisfied and has less work to do. What are your favorite hobbies you enjoy outside of work? My life outside of work revolves around my children. I spend most of my weekends taking my mother to run her Saturday errands and take everyone’s children to church on Sunday. I also love animals and pets.